Who would be the new protag(or protags) in a hypothetical spin off/sequel if Ash ever retires? Discussion in 'Pokémon Animé Discussion' started by Power Up, Aug 29, 2018. I'm thinking either his kid(s) or some kid who got inspired by him. No thanks, have it be someone completely unrelated to Ash, and have them be female. Cat's Eye Draco, Satoshi & Touko and LilligantLewis like this. It would be kinda cool if we could get a Pokemon Ranger spin-off anime series. Xeogran and Moonlight Starlight like this. Of corse - for each new generation own hero(es), like in games and manga. And my opinion - in first Saga without Ash in main role, they can make one of members of group - Meowth, as ex villain, he can be like Iago from Aladdin (in cartoon series). This also can be one of ties with the past. Talk about past - Ash can still appeared in each new anniversary season, for 5-10 episodes. And in one of future generations - main protagonist can be son of Ash and Serena. I would like that. But let it be the daughter of Ash. The problem is they keep dumbing down the use of the girls in recent seasons. They take less part in the slapstick and wilder fillers and they won't even let them be in fights where they're taking hits back most of the time. You have a character like that do the main quest and they risk being a blander more invincible female version of Ash. I get the feeling a male protagonist would just be a slightly tweaked copycat of Ash however. I'd prefer someone unrelated to Ash as a character, probably more focused on the regional evil team. Ash's shelf-life is really long because of the formula of the games. It's all the same, gym quest then the league. It's not that hard to adapt; however, if you make a new protagonist more focused on the evil team due to a personal connection, you limit the shelf-life. Let's be honest with Ash, he is among the many bottlenecks when it comes to proper worldbuilding because the anime is always so narrowly focused on him. Even in SM, the perfect series for a decentralized story where everyone can shine, even focuses too much on Ash and not enough on the other characters because he's such a cash cow. Jessie and James's daughter (Still believe the anime should bring them together). My Friend Code: 4098-4422-2793 Add me. If the show had ended after XY, which it did not, I would have liked the next gen to be after about a 15-20 year time skip, have Bonnie be the main character as an adult, with Dedenne as the new mascot, she has 2-3 other guys/girls who travel with her who are her own age and/or teenagers, and also the little kid role (the "Max/Bonnie") is Ash and Serena's son. If the writers want to keep a connection between Ash and the new protagonist, then the new protagonist would probably be his child or grandchild. (Personally, I would prefer Ash's grandchild, rather than his child, as the protagonist. The greater distance between them could allow for more creativity when it comes to legends surrounding Ash and how those legends affect his grandchild on his/her journey.) Even if the writers don't particularly care about keeping a connection to Ash, I still think Ash would play a role in the new protagonist's life, even if it's just as an inspirational figure. The writers have been dumbing down the use the female companions in recent seasons. I highly doubt the writers would treat a female protagonist the same way they have been treating the female companions. A female protagonist would have to get involved in heated battles where she and her Pokémon take hits; she would have to take part in the slapstick and wilder fillers; she would have to be put in danger. Essentially, the writers would have to treat her the same way they treat Ash, with regards to the types of situations she is put into. LilligantLewis, NanoMoltres and Pokegirl Fan~ like this. While I don't mind a female protagonist like Bonnie, Dedenne doesn't have the same star power as Pikachu, so I doubt the anime would be a treat without our iconic Pokemon. Also, you're surely want to give the Amourshippers a treat with the whole Ash & Serena's son thing, aren't you? Despite the mirror verse joke, honestly like some have said, I'd prefer if a hypothetical new main protagonist had no relation to Ash whatsoever, and I definitely don't want any shippings to become canon. Let's not start a fan war. Cat's Eye Draco, Darthlord7 and Pokegirl Fan~ like this. Which is kinda the reason I doubt they'd have a female protagonist (granted I doubt they'd replace Ash to begin with). Lillie who is a deuteragonist in much of SM and gets occasional indiscriminate hardships is probably what they are most comfortable going up to right now. I know an artist from DeviantArt who is doing those Amourshipping arts, with Serena & Ash completely grown up, being married and having kids, the fanbase went nuts with these arts. I know they're headcanons but I wonder if there's any other Ash shipping fans that can compete against that artist. 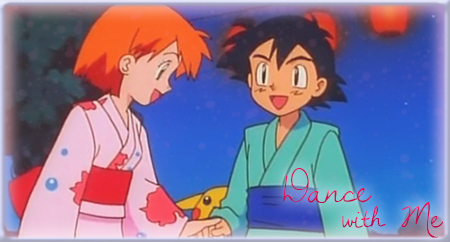 Before Amourshipping came in picture , I've seen numbers of fanarts of Ash and Misty being grown up and married and have their own kids.